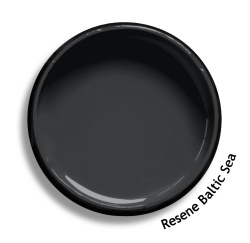 Colour notes: Resene Baltic Sea is a cold dark charcoal, contemporary and intrepid. Also available as a Resene CoolColour. A change in tone or product may be required for some colours to achieve a Resene CoolColour effect. Meets Hanmer Springs permitted colour standard (roof and trim). Recommended complementary colours are from the Resene Total Colour System and may not be included in this Resene special palette.